Wow, how terrible! Thank you so much Ani, I really appreciate your posts. What caused the roof to collapse? Was she being processed for another launch? I think it was too much snow. The roof had weakened enough over the years (not enough money for maintenance) it couldn't support the snow weight from a major winter storm, and gave way. It was the end of the cold war, there was no more money, if I recall, in fact its via sure determination of our Russian friends that it got launched at all..
Sure look like it! I wonder if THIS was the reason the program never made it to a second launch! My goodness, they are simply letting her rust? Thank you so much Anik. You are a very valuable poster on this forum. I'll third that...and he's been here from about the start! I am just so amazed, how something that in the west looks complex, but looks simpler, no make that KISS in Russian... Look forward to the next Russian develpment that takes flight..
Whats the item on the tank ahead of the orbiter? Anik, how many Buran's are there left? I've never seen so many. Two in the hanger covered in dust. One rusting outside, one on the stack above, one in Gorky Park, one the desert? Six? IIRC, I think only one (the one mounted in the hangar pic) is a 'flyable' ship. The others are all testbeds and boilerplate models. Just to clarify everything that has been said (it's not too clear): the one that was destroyed in the roof collapse was the one and only that made the flight into space. It is unfortunate now because all three of the world first reusable spacecraft (not counting Gem 2) are destroyed now. 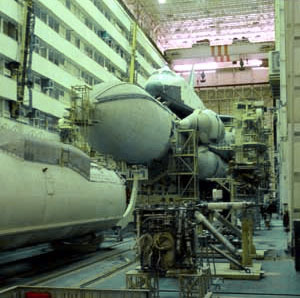 The ones still surviving and collecting dust are atmospheric test articles, and (two I think) that were intended to be flown in space but never got that far when the program was terminated. You can buy the heat tiles meant for and used on the Burans today, they appear in auctions and ebay all the time. And don't forget the fact that Buran had turbo engines to allow it to 'go around again' unlike the Shuttle when it returned. That's one thing that would make it 'softer and smoother' thought I don't think they used those on the test flight. Also notice that Buran used drag chutes long before the Shuttle did.